When you're working for yourself it's like any other job, you need to stay healthy and create healthier working habits to get your creative juices flowing. A lot of the time you can get caught up in a writing project and forget to eat, exercise and get fresh air. You need a balanced life where by you can fit in your me time and keep you in great shape. It's so easy to sit for hours on end at your keyboard, check out this article about sitting too long. You could consider an ergonomic chair or purchase a standing desk. If that sounds a bit expensive make your own standing desk . Take note of how you sit at your desk. the best way to sit is to let your head rest naturally on your shoulders and don't lean too far into your computer. Your knees should be bent at right angles, and don't cross them. Your feet should be firmly resting on the floor or foot rest. Prolonged hours at a computer screen can lead to eyestrain. To avoid these problems try following the 20-20-20 rule: take a 20 second break every 20 minutes and look at an object that is at least 20 feet away. After you've been sitting all day stretching is a good idea, you can do this by stretching in the opposite direction your body has been sitting. Try clasping your arms behind and opening your chest, then let your head gently fall back. You could also trying resting your legs against the wall with your feet point up and to change the direction of your circulation. Take a break outside and change your surroundings this will give you a fresh insight into your project and help you tackle any tough problems. Take a walk at lunch time or set a time during the day to have a short break outside. Choose your exercise of choice and do it regularly, this will help to stimulate your mind and boost your creativity amongst other things. Exercise regularly and consistently and your productivity with increase dramatically, not only improving your health but also your mental health. Coffee should be drunk minimally, drinking too much can lead to fatigue and lack of focus. Water is the drink of choice, if water isn't your favourite try flavouring it with cucumber, lemon, mint or ginger with a fruit infuser water bottle. Working for yourself can be more demanding than working for someone else, because you have to find the time that is most beneficial to you and your working day. 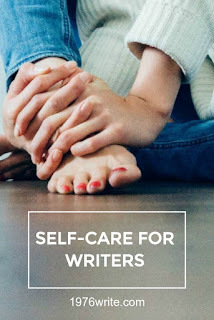 You need to decide on a routine and stick to it, but give yourself a limit, check out "The Art of Less Doing" to discover how you can manage your writing and your life. If like me you only have a small space to work in it's still important to keep that space uncluttered and organised. Documents, books, and files should be kept in a filing cabinet or box out of the way. Keep your workspace separate from your resting space, which is your lounge, living or bedroom.